'Chip Lusby, also known as Sutter Chip lived in Covina CA near Mt. San Antonio college where he taught Electronics. Being attracted to Sutter Creek in 1978, but not able to find a house that fit his vision Chip decided he would move his 3000 square Victorian house from Azusa CA to his property in Sutter Creek. The walls were dismantled and trucked to location and Chip spent weekends and holidays assembling his new home and guest house. Being an amateur pianist (and the director of a jug band) Chip soon became active in the annual Sutter Creek ragtime festival. Three pianos grace his living and dining room. Guests find lodging at his house at festival time and performers returned to give house concerts at “The Ragtime Inn”. Chip welcomed musicians that played styles other than ragtime referring to the venue as “Skunk Hollow Victorian Gardens”. For each event Chip orders a case of wine with the performers represented on a nicely designed custom label to supplement a wide variety of refreshments. An unselfish facilitator, Chip passes all contributions at his events to the musicians. Chip plays a large role in expanding community trust and good will. Before each of the six “Flowers from Ashes” benefits for Butte fire victims he was building stages, moving tables and chairs and putting up direction signs. Then, after a shower he would return early to take tickets or pour wine. After the show he would be there with his pickup, lightening the load of labor and sharing the joy of success. 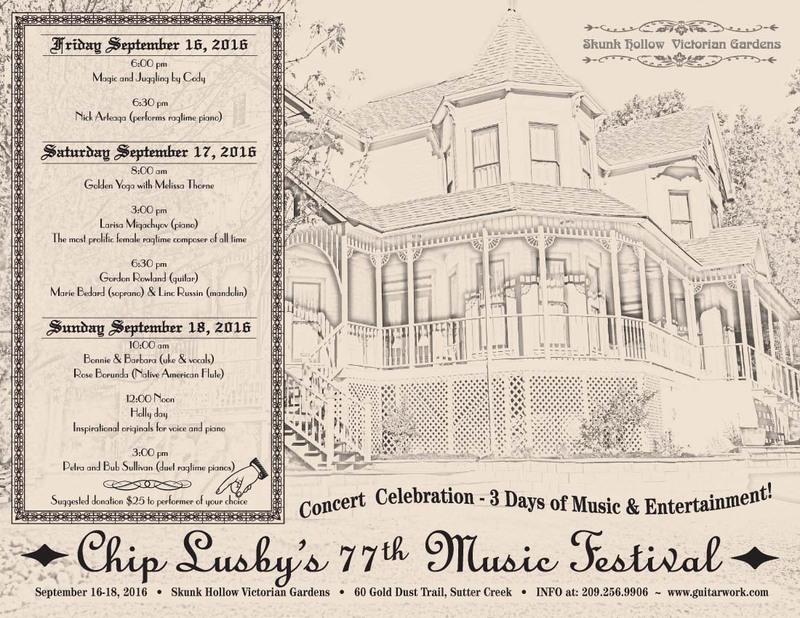 This is a rare community opportunity to hear music of all styles, and to honor Chip for providing this community model with music at the center. I really enjoyed these San Francisco venues and you can definitely find me here for more events. I didn't eat anything when on my recent visit, but those around me had truffle fries, pizza, and wings all seemed to enjoy. You can tell that so much love and creativity went into making it special. best pillow is the best option for comfortably sleeping at home.